Photograph by Margaret Olin, as part of “Making Time,” her series of images from the Dheisheh Refugee Camp, just south of Bethlehem. Woodbridge, Connecticut, a sleepy suburb fifteen minutes northwest of downtown New Haven, is an unlikely home for Palestine Museum U.S.—the first and only museum in the Americas dedicated solely to Palestinian history, culture, and art. Woodbridge has a sizable Jewish population: two Jewish community centers and three synagogues flank the museum. It’s exactly the kind of place where one might expect a museum dedicated to Palestine to raise more than a few eyebrows. This “mumble jumble”—which, this past summer, included border protests and shootings in Gaza, paired with the Trump administration’s divisive decision to move the U.S. embassy from Tel Aviv to Jerusalem—overshadows much of the discourse around Palestine in the U.S. The U.S. was the first country to recognize Israel in 1948, and has long been Israel’s largest trading partner and political ally. Most Americans learn about Palestinians through politicians like Newt Gingrich, who has called the Palestinians an “invented people,” or Donald Trump, who recently tweeted that Palestinians do not “appreciate or respect” the U.S. and are unwilling to talk peace. Far more Americans sympathize more with Israel (54 percent) than with the Palestinians (14 percent) in the Israeli-Palestinian conflict, according to a 2016 Pew Research Center Foreign Policy study—in contrast with global public opinion, which is generally more sympathetic to the Palestinian cause. 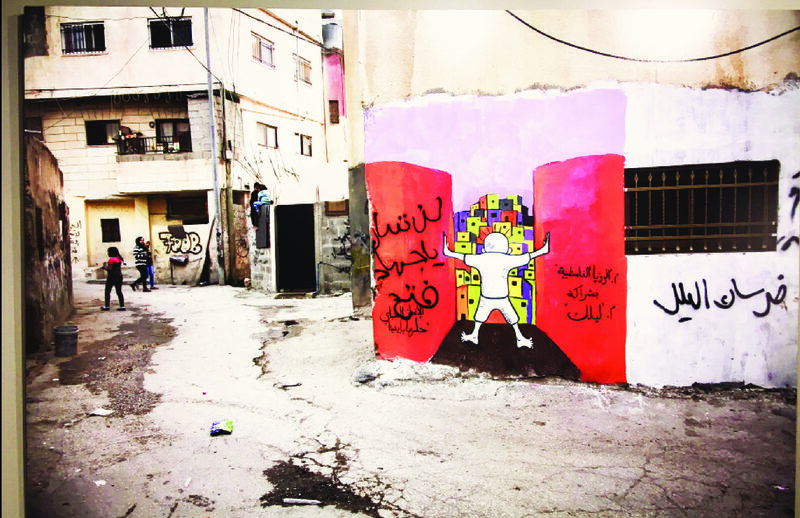 In this polarized political climate, Saleh feels that art humanizes Palestinians, providing an entry point into dialogue in a way that no political negotiations can. Saleh came to the U.S. to finish his high school diploma in 1969, when he was seventeen. He received a Bachelor’s degree from Oberlin College and an M.B.A. from the University of Connecticut, and has lived in the United States ever since, working in human resources for over forty years. He opened the museum on the ground floor of an office building he owns on a quiet stretch of the Litchfield Turnpike. Renovations began in September of 2017, and the museum opened less than a year later, in April of 2018. According to Saleh, about half of the museum’s visitors are of Palestinian descent, often hailing from Boston, Philadelphia, and New York. In addition to showcasing Palestinian art, the museum also hosts cultural events. In recent months, it has hosted a traditional Palestinian storyteller, an Arab-Israeli member of the Knesset (Israel’s parliament), and a comedy show with a Palestinian-American comedian that drew a crowd of over a hundred people. I arrived for a tour on a Sunday afternoon. A floor-to-ceiling mural on the left wall of the reception area featured the pensive face of a young white woman, superimposed over a scene of the young woman standing in front of an armed bulldozer. Chris, a volunteer, told me that the mural was painted in tribute to Rachel Corrie, an American pro-Palestine activist killed by an Israeli bulldozer in Gaza in 2003. An aerial photograph of Jerusalem extended across the wall opposite the mural, and a table lined with books related to Palestine stood in between. Dina Omar, an Anthropology graduate student at Yale and museum volunteer, approached and introduced herself. Omar is Palestinian; her family hails from Ramoun, a small village in the West Bank. She led me from the first room, the reception area, into a larger gallery, filled with black-and-white photographs on three walls. A middle-aged man with white hair and glasses was nailing down some of the photographs whose edges had curled up. (“It’s the weather,” he said.) He came over and introduced himself as Faisal. Saleh and Omar took me on a tour of the four-thousand-square-foot museum, which consists of several galleries and a large event space, all on the ground floor of the building. Saleh began with the collection of pre-1948 photographs of Palestine, which he picked out himself. “We wanted to show what Palestine was like in the nineteen-hundreds, that there was a thriving community of Palestinians,” he said. A few photographs depict Palestinian resistance against British rule and Zionist emigration to Palestine. Others present scenes of everyday life: a cotton market in Jerusalem, a class picture of students at a girls’ school. Saleh led me to a case containing an old passport labeled “The State of Palestine” and a small business ledger. These documents belong to Saleh’s father, who owned a business in Palestine that grew and exported fruit. The staple holding the documents together, Saleh proudly told me, had survived since 1946. Most of the artists on display are from the West Bank or Gaza—some still live there, while others live and work abroad. One objective of the museum is to provide a market for Palestinian art. “Art galleries in Palestine caught wind of this gallery and were hungry to show in the U.S.,” Saleh said. The Palestine Museum invites proposals for exhibition from Palestinian artists on its website. Saleh is open to featuring artists working in a variety of media. Omar showed me a wall with expressionist paintings of solemn, richly colored figures, made by Malak Mattar, an eighteen-year-old artist from Gaza. One painting—titled “The Memories”—depicts a gaunt woman with sunken eyes and arms held tightly at her sides. “Many of her paintings appear claustrophobic, mirroring what life is like in Gaza,” Omar explained. Depictions of claustrophobia and isolation recur in many of the works on display, reflecting the constraints of life under occupation and in the diaspora. “We are a very scattered population that is, by design, separated,” she said. For Omar, the art is evidence of the power of human expression to triumph in spite of external constraints. “When you can’t say what’s overtly happening to you, oftentimes art can be a separate sort of entity for your own self-expression,” she said. Saleh is content with the success of the museum in Woodbridge, but he has bigger plans. Eventually, he hopes to create branches of the museum in major cities around the U.S. This next stage, however, may present more obstacles: “It’s not just financial cost,” he said. “You’re going to run into opposition from people who don’t want a Palestinian museum in New York.” One exhibit currently on display in Woodbridge features artwork made by Gaza children who survived the 2008-2009 Gaza War. Saleh told me that this is the first time the exhibit has been shown in the U.S.: a previous exhibition at an Oakland children’s museum in 2011 was cancelled in response to complaints from pro-Israel Jewish community groups. The drawings and paintings, which the children produced as part of post-traumatic stress therapy, depict scenes of graphic violence: Israeli tanks firing on civilians, dead bodies lying on the street. When I asked Saleh how his museum was able to showcase the exhibit, he laughed. “No one can pressure us because we don’t owe anyone anything.” He is financing this start-up phase of the museum alone. Alperin knows Saleh as a friend of the Jewish community. In December of 2016, a fire in the Jewish Community Center forced the organization to relocate. Saleh offered up fully-furnished space in his building. Last month, the Palestine Museum hosted a service to celebrate Rosh Hashanah, the Jewish New Year. Mikveh helped to organize the service, which was attended by about fifty people. “A lot of holding this event was sinking into living the present and the future we think is possible: something where there’s nothing special about Jews hosting Rosh Hashanah at the Palestine Museum,” she said. Saleh hopes that demonstrating the humanity of the Palestinian people will show what he views as the absurdity of Trump administration decisions like defunding the United Nations Relief and Works Agency for Palestine Refugees in the Near East. To Saleh, this decision appears particularly unjust when juxtaposed with the three billion and eight hundred million dollars of aid that the U.S. sends to Israel each year, mostly in the form of military support. — Leila Murphy is a senior in Morse College. Thanks for publishing this article about this amazing new museum. You might be interested to know that the title image is part of a series I photographed, “Marking Time,” in the Dheisheh Refugee Camp, and that the mural in the foyer, of Rachel Corrie, is by Ayad Arafat, an artist from Dheisheh, many of whose murals can be seen in my photographs of the camp.